This is a story about my brother and a particular train. So my brother commutes to work everyday and he uses the commuter line train in Jakarta. 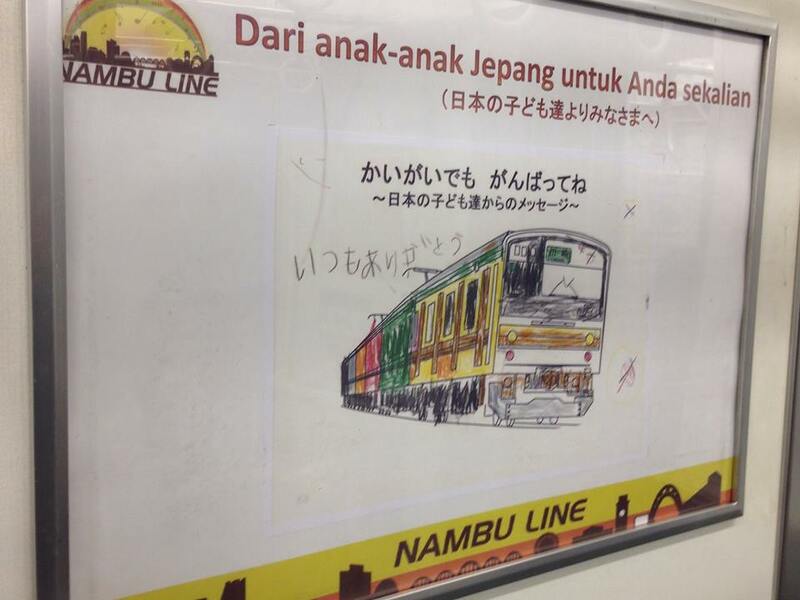 Being a Japan – culture enthusiast he somehow found out a rather touching story about one particular Japanese train, 205-0 series train from JR Nambu Line. This train recently ended its service in Japan last December because it’s going to be shipped to Indonesia (Indonesia has been actively buying Japanese old trains for our commuter line). On its very last ride, the train conductor on board made a very touching speech. In addition, the train is reportedly decorated with pictures and some thank you notes from Japanese kids who used to ride the train. You can read the full story here. Well I don’t speak Japanese, but I found the idea very touching, still. Don’t you think? Being a kind-hearted and brilliant person that he is, my brother then had this idea of sending another thank you note to the Japanese people, basically telling them that the train has arrived safely in Indonesia and is operating smoothly on a daily basis. 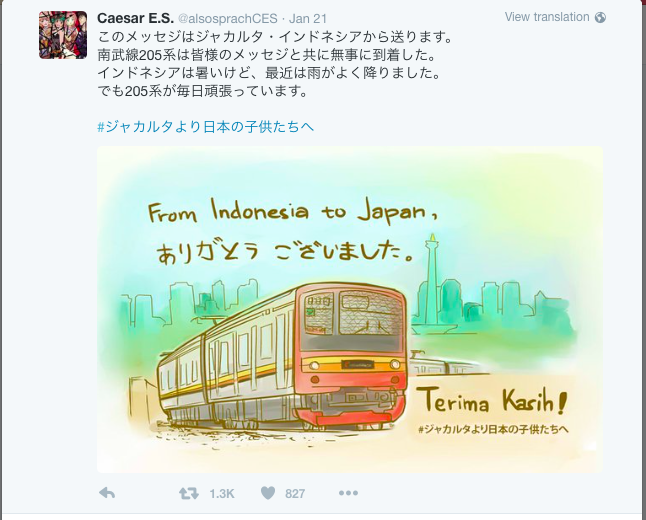 Because he has limited proficiency of Japanese language he contacted his friends to translate the message, drew a picture, and then tweeted it yesterday to his personal account. 24 hours later – it has gotten over 1000 RT. I am an advertising graduate and I used to handle a Twitter account of a very credible organisation but none of the campaigns I organised ever reached this milestone. Wow. Meanwhile, this is just something that my brother did out of his genuine interest and sincerity… A simple ‘thank you’ message. Now, I’m sharing this story with you not because of the RTs and likes that he got. They’re just a number. But if we see it from a Marketing perspective.. why do you think his tweets got so many response? Well, I think it’s because (1) the message is sincere and honest (2) it is simple (3) it gives a “life” and “emotion” for a “product” (4) it reaches specific communities.. the Japanese trains enthusiasts, Indonesian KRL users, and of course, Indonesian Japanese culture enthusiasts….you know how it is with communities, yep. Those points are not new, for sure. They have been talked about over and over in marketing lectures/seminars… but still what happened with my brother makes me want to remind you (and myself), that emotion and connection always win in today’s cluttered environment. Hehe, I think you nailed the points. It is all in the sincerity and its connection to the people in the personal level which made it “viral” 😀 . IMHO, that is why a lot of companies tries to “emotionalize” several events they have in their company to their customers. For instance in the airline industry, KLM’s “farewell” flights when they retired one type of their fleet (MD11 at the end of 2014, I even wrote a post about that 😛 ) or just a few weeks ago when Air France retired their Boeing 747-400 fleet and they posted a few photos on Instagram 😛 . Such a very simple and genuine gesture. And that simple gesture is very appreciated, I’m sure, by the Japanese people. I’m going to share this story with my Japanese friends. Orang Jepang menghargai hal-hal kecil macam gini Ta. Moga-moga nyampe ke para pengguna keretanya ya. Ah you brother’s sincerity and care are so touching. No wonder the tweet got RT’ed a lot in a short time. Very well done of him. Hi christa, ini manis banget. Saya juga pengguna commuter ijin share di akun facebook saya ya. Terimakasih.